These were first seen over at Crafts Unleashed. I decided to blog about them here as well in case y’all missed them. 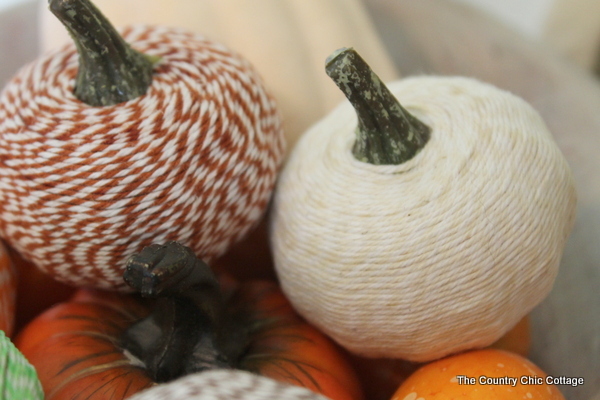 They are probably my favorite fall project this season. 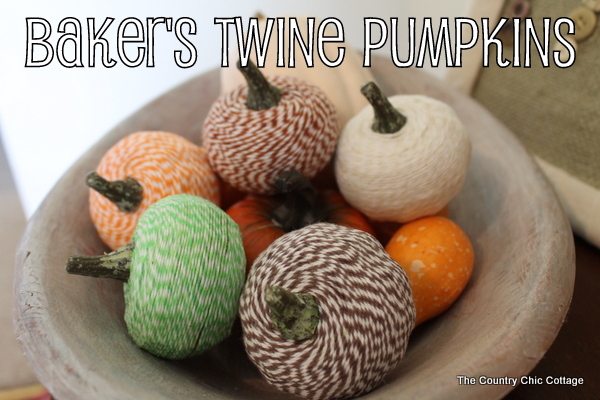 These baker’s twine pumpkins are simple, timeless, and can really go with any home decor style. Have you made any of your own yet? What are you waiting for? Links are affiliate links and a portion of your purchase will go to support this site. My materials were supplied by Consumer Crafts but all projects and opinions are my own. Begin on either the top or the bottom of your pumpkin. I actually started on the top of the small pumpkins and the bottom of the large one. 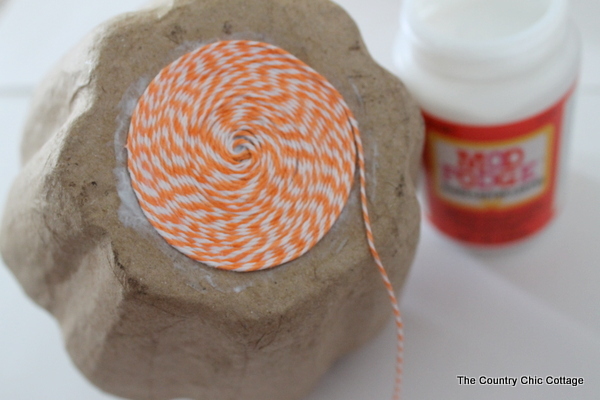 Coat a small area in Mod Podge and begin to wrap in twine. 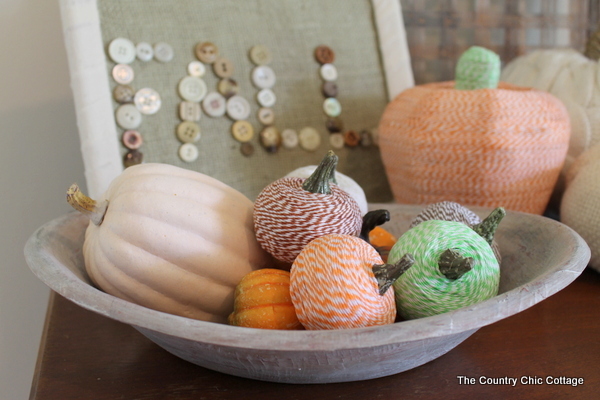 This craft is messy as you will get Mod Podge on your hands but I found it was the best adhesive for the baker’s twine. You can pretend you are in school as the Mod Podge peels off your hands and looks like skin. Please tell me you did that too? Keep wrapping and wrapping and wrapping. 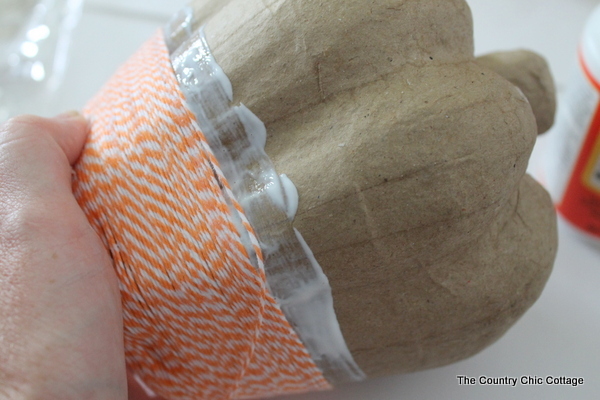 Be sure to put your twine tight as you wrap so you don’t get any gaps. Using lots of Mod Podge worked best because the surface is bumpy and can be hard to work the twine around. Push your twine down next to the row before it as you work your way up. On the smaller pumpkins, I actually left the stem alone. The end of the twine can be tucked under the stem on this end. I really liked the natural appearance of the stem on these. The larger pumpkin got a green baker’s twine stem as well as the orange on the body. The larger pumpkins especially take a while. Pop in a movie before you start on this project. Within the span of a movie, I had a large pumpkin and five smaller ones. 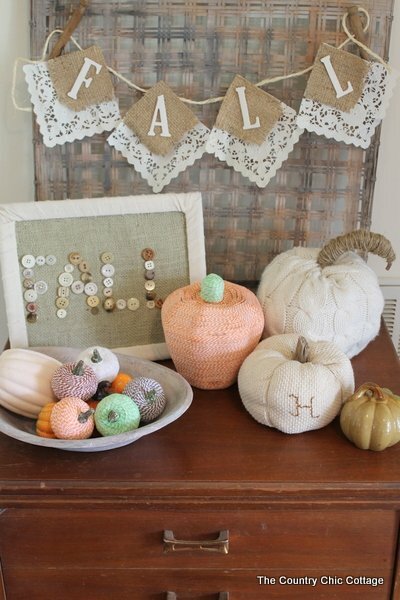 Enough to add to this display and make a very cute baker’s twine touch to my fall decor. I think it was well worth it, don’t you? Intimidated? Don’t be! 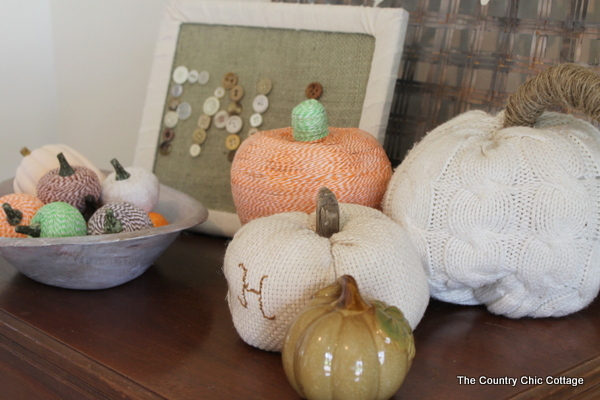 Start with a small mini pumpkin and some Mod Podge. Wrap the small ones until you get the hang of it. Then you can dive head first into a large pumpkin. 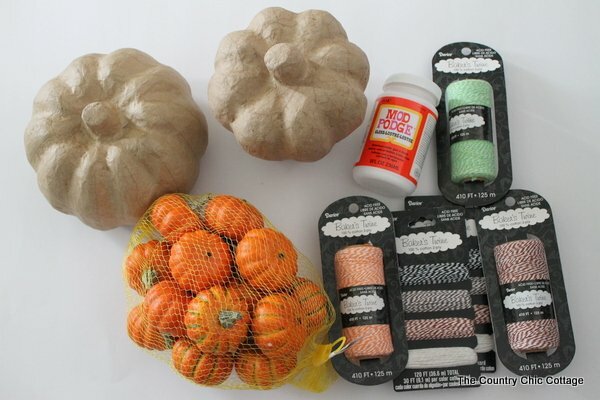 One large roll of baker’s twine will easily do a large pumpkin so don’t worry about running out. 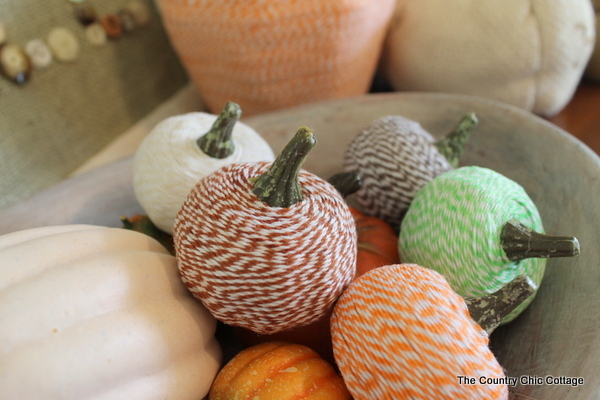 Add these to your home for fall and to impress your Thanksgiving guests. They will be amazed at your little creations! 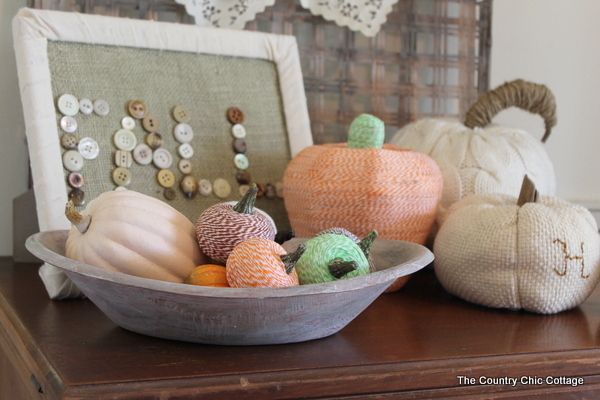 next post: DIY Ombre Sweater Pumpkins – NO SEWING! These pumpkin design were awesome. They are all well prepared and crafted. Great creation. Danielle! These are precious! I have a large jar that sits on a shelf in my den and every season I try to think of something new I can use as a filler for it. I can just see it full of these little minis. Guess I better get started!